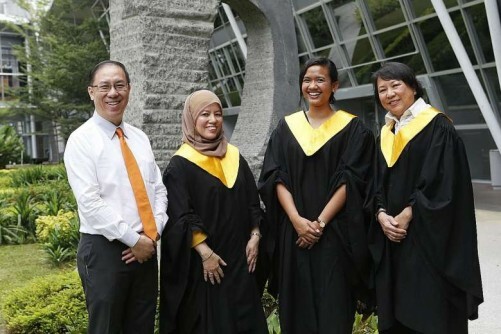 HE WAS 27 and only two years into his job as a Straits Times photojournalist, but on Sept 30 in 2009, Mr Desmond Lim was asked to go to Padang, Indonesia, to cover a 7.6-magnitude earthquake as soon as he could. With the Padang airport closed and all commercial flights going there cancelled, Mr Lim just had to "wing it" - he went down to Seletar Airport and stealthily joined several employees of a communication firm as they boarded a twin-propeller plane to Padang. It was only after he got on that he managed to persuade his fellow travellers to give him a ride. 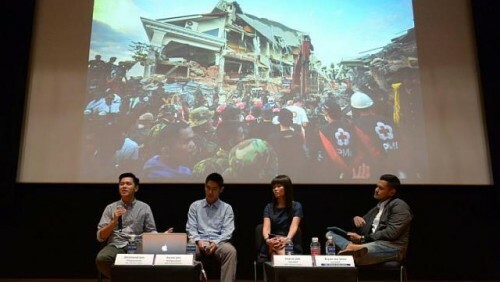 Mr Lim, now 32, was sharing the story of how he covered a natural disaster, along with fellow ST photojournalist Kevin Lim, 32, and journalist Joyce Lim, 39, at the National Museum of Singapore on Tuesday night. 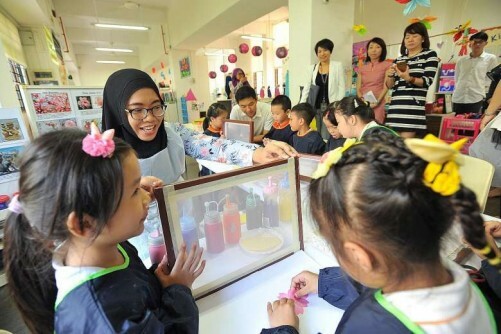 The 90-minute event, the fourth and last talk, was part of the Straits Times Appreciates Readers programme, held in conjunction with We: Defining Stories, an exhibition of more than 400 photos. Speaking to a 105-strong audience, Mr Lim recounted how he reached Padang Pariaman, which had been hit by a landslide that buried people and houses in mud 6m deep. To get there, he crossed a bridge of wooden planks tied together with twine, while a muddy river raged beneath. "Villagers were using their bare hands and whatever they could find to dig into the mud, hoping to find their loved ones," he said. Mr Lim said he often questioned himself. "Sometimes, I feel like a disaster tourist because I know I will go back to my comfortable home at the end of the day." It was a point also raised by Ms Lim, who was in Malaysia earlier this year to cover the MH370 tragedy. The plane went missing on March 8 and has yet to be found. She spoke to grieving families, and saw reporters and photographers getting punched and kicked by the relatives of the passengers. 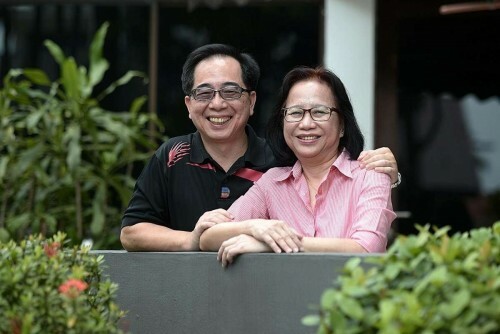 People often ask why she does not leave the grieving alone, said Ms Lim. "But if I don't try to speak to them, I will not know their problems, the help they need, and what they are currently receiving from the authorities." Mr Kevin Lim spoke about the four days he spent in the city of Tacloban in the Philippines to cover Typhoon Haiyan, which claimed more than 10,000 lives. He saw cars wedged between trees and ships blown into backyards. When he returned six months later, the ship in one resident's backyard had become an attraction. "You can destroy their homes, throw a ship in their backyard, but life still goes on." Civil servant Bernard Yeo, 38, was struck by Mr Desmond Lim's resourcefulness. "We readers just read the story, but we don't know what goes on behind."